The excavations of the 8,000-year-old prehistoric settlement at Mursalevo were extended in August 2015 because of the significance of the archaeological discoveries made there. The rescue digs at the site known to Bulgarian archaeologists since the 1930s were originally supposed to last for five months, between April and September 2015. However, after the Early Neolithic settlement was found in May, the Bulgarian authorities gave the archaeologists a three-month extension – till the end of November 2015. Now it has emerged that the digs near Mursalevo have only been wrapped for 2014, and will be resumed for three more months in April 2015, reports local news site Blagoevgrad.eu. At the end of June 2015, however, the archaeologists will have to step down, and leave the place to construction workers building the Struma Highway which will connect the Bulgarian capital Sofia with Greece. “We are continuing the excavations of homes built 8,000 years ago. We are already down to the level of the initial horizontal planning of the settlement. The houses are very well preserved, with superstructures, with traces of fire on the vertical pillars supporting the second floors and the roofs. We have found interesting artifacts, ceramic vessels, and other small finds. This Neolithic settlement has Europe’s largest excavated area [for a site from this period], and very well preserved remains," explains Prof. Krum Bachvarov, Head of the Department of Prehistory of the National Institute and Museum of Archaeology of the Bulgarian Academy of Sciences, as cited by the Bulgarian news agency BGNES. “This is an excellent chance for Bulgaria to exhibit in situ at least these [parts] that can be preserved after the construction of the Struma Highway," Bachvarov adds. Even though the archaeological site near Mursalevo, Kocherinovo Municipality, in Southwest Bulgaria has been known since the 1930s, no major excavations had been carried out there until the present rescue digs prompted by highway construction. The Mursalevo prehistoric settlement was founded by agriculturalists coming from Asia Minor who had domestic animals and cultivated crops. Since April-May 2015, the Bulgarian archaeologists have found dozens of artifacts, including figurines of the Mother Goddess, ceramic vessels, tools, a golden application worn on a person’s year as a decoration but also as a sign of status, a button, and a needle; some of these finds are unique in world archaeology. The Early Neolithic settlement near Mursalevo is especially notable for its planning and building alignment. It even had a main street, and some of the houses made of plant stalks and clay had two storeys. 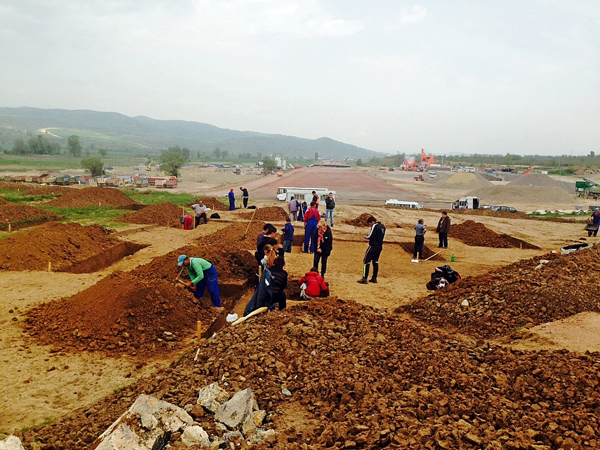 So far the Bulgarian archaeologists have uncovered more than 20 homes. They believe the settlement was burned to the ground on purpose because of traces that the buildings were filled with firewood and set on fire. In addition to the prehistoric settlement, the archaeologists have found an Ancient Thracian sanctuary built on top of it, which dates back to the 5th-1st century AD, and has over 20 pits for rituals and sacrifices. In one of the Ancient Thracian pits located in the northwestern part of the site, the researchers have found the skeleton of a calf that was sacrificed, with a knife blade found next to its head which was laid in a way that it could bleed out. The future Struma Highway will pass right through the middle of the Early Neolithic settlement near Mursalevo but its eastern and western ends will be left intact and will be protected from the highway with walls. The Bulgarian authorities plan to complete Lot 2 of the Struma Highway (running between the town of Dupnitsa and the city of Blagoevgrad) by October 15, 2015. After that, the archaeologists will continue to excavate the western section of the prehistoric settlement located between the future highway and the railway line passing nearby.